Spring has arrived and families are gearing up for the kickoff to summer 2015: Memorial Day! Families use this extended weekend to enjoy fun in the sun as well as spend quality time with the family. For families who are planning a Cape Hatteras vacation, Memorial Day weekend on the Outer Banks offers a wide variety of activities and fun. Plan a fun-filled weekend by trying out some of these great things to do while on Hatteras! 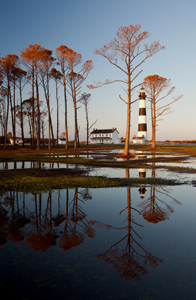 Memorial Day kicks off the 2015 season for the Cape Hatteras Lighthouse and many of the surrounding lighthouses. Starting the Friday before Memorial Day, the Hatteras Island Visitor Center near the lighthouse will be open to the public. Visit the center and learn about the history of the Cape Hatteras Lighthouse and pick up some souvenirs from your journey. After visiting the center, join a guided tour of the lighthouse grounds and finish by climbing to the top for spectacular views! Drive up to Roanoke Island Festival Park in Manteo and enjoy an afternoon of fun shag music! Take a step back in time and dance away the afternoon with some of the country’s best shag bands. Bring along a lawn chair or blanket and relax while listening to music of years past. Make a day trip out of the event and explore Roanoke Island’s history, shopping and dining! Another great event to attend while in Manteo is the Cupcake 5k! This charity event focuses on raising money for cancer research and assistance to cancer patients. Whether you are an avid runner or just want to walk for someone, the Cupcake 5k will surely be an event not to miss! Try out a new activity that you have been wanting to attempt! Whether it is surfing, kayaking, SUP or any other watersport make this trip to Hatteras Island the year you try it. Memorial Day offers warmer waters for water activities for the entire family to try. No Outer Banks vacation is complete without some time enjoying the beach and the Atlantic waves! Rent a few surfboards or paddleboards for the family and let everyone have a turn conquering a new sport! These are just a few activities you can try during your next OBX vacation! Don’t see your favorite? Tell us about your favorite OBX activities that families can try during Memorial Day weekend!